This is an amazingly tasty and easy chicken salad recipe, packed full of vitamins and minerals. This chicken salad is a firm favourite with my family. Whenever a recipe calls for a mayonnaise base, I always reduce the amount of mayo I use by combining it with natural yoghurt. This is much healthier with no compromise on taste and you have the added benefit of gut-protecting probiotics from the yoghurt. Broccoli is an incredible superfood that helps the liver detox, fight off illnesses and contains more vitamin C than oranges. It is high in beta carotene and potassium which help fight off heart disease. Broccoli also has powerful anti-cancer properties. Studies have shown that eating cruciferous vegetable such as broccoli, cauliflower, cabbage, kale and Brussels sprouts can lower your risk of colon cancer by up to 60 percent! Walnuts are also a superfood high in essential fatty acids, especially omega 3 fats which are essential for great heart health and proper brain function and is especially beneficial to children who are so often lacking these fats. Apples are another deliciously amazing superfood. They are packed with antioxidants, help lower bad cholesterol levels, reduce the risk of cancer and help strengthen our bones…and these are just some of the apple benefits. 1. Put the chicken pieces, mayonnaise and yoghurt in a bowl and stir until nicely mixed together. 2. Add the rest of the ingredients and lightly stir until all combined. 3. Serve with an additional side salad or with some crusty whole wheat or rye bread. You can use left over cooked chicken for this recipe or cook some specially. I like to use filleted breasts for this salad which I cook in a bit of stock to give it a lovely flavour. This easy chicken salad recipe is incredibly quick and easy to make so it is well worth a try...and I'm sure that once you've tried it you will be making it again by popular demand! 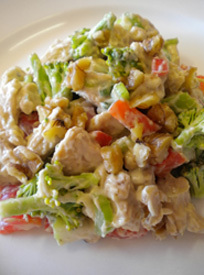 If you have a healthy chicken salad recipe you would like to share on this website, please click on this care to share? link to submit your recipe. I am always so thrilled to receive new and exciting healthy recipes.